It's the processor gamers and PC enthusiasts have being waiting for. AMD's Ryzen 5 CPUs bring together unbelievable performance and incredible value for money. 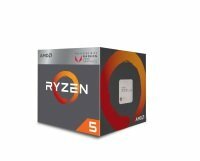 With quad or six core options and up to 12 threads, Ryzen 5 processors have a base clock speed from 3.2GHz with turbo up to 3.7GHz depending on model. All Ryzen 5 processors are also unlocked for overclockers to further boost the performance of their PCs. These processors are based on the Zen architecture and are compatible with AMD's AM4 socket motherboards. With Ryzen 5 you can game and stream simultaneously or discover infinite potential for creativity with this class-leading processor.